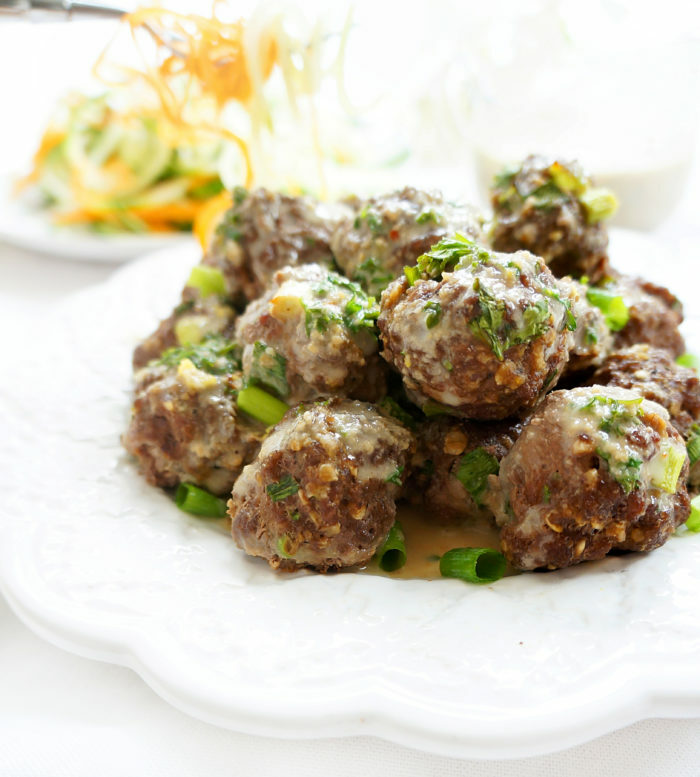 These Asian beef meatballs are served with a flavourful and spicy peanut coconut Thai sauce. Tastes great paired with zucchini noodles or brown rice! This week, I feel like I’ve been running around like a mad woman. So I apologize in advance if I fall off the face of the earth for a few days. Lately on the weekends, Matt and I have been getting crazy domesticated. We hit up a gigantic antique market this weekend, and have all of these DIY projects in the works. I’ve also put him to work in the kitchen helping me with testing recipes every weekend. Gotta love a flexible guy whose up for everything. We have a lot of fun coming up with new creative dishes together…and trying them out is always fun too! These days, we’ve been experimenting with a lot of Asian recipes. I’ve always been a big fan of Asian tastes and flavours, so I’m excited about some of my upcoming recipe posts! 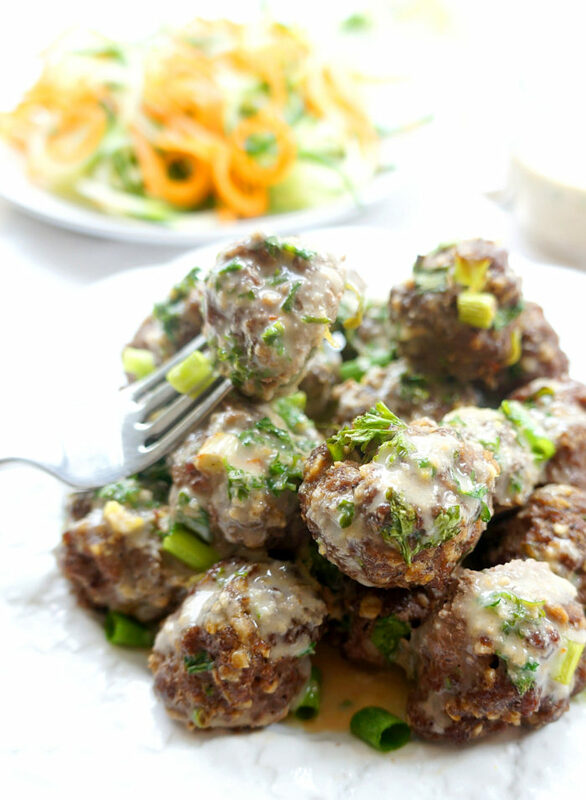 One of our recent experiments were these Beef Meatballs with Coconut Thai Sauce. Yes we had another one of our famous meatball-making weekends. Life wouldn’t be the same without meatballs. I just love how you can pack so much flavour into a little ball of meat. Like who even invented that?! I find that the Thai coconut sauce totally makes this recipe. I love the combination of the coconut milk, peanut butter and spicy kick. So flavourful….like to the point where I almost licked the bowl. Preheat oven to 400 degrees F. Spray a rimmed baking sheet with cooking spray. Set aside. To make meatballs, combine all meatball ingredients in a large bowl. Form mixture into approximately 24 meatballs. Place on prepared pan. Bake for 18 to 20 minutes, until the meatballs are cooked through and nicely browned on the outside. While meatballs are cooking, prepare sauce. In a deep, non-stick skillet, whisk together all sauce ingredients. Heat over medium-high heat, stirring constantly, until sauce boils. Reduce heat to medium and cook, uncovered, for 3 minutes, stirring often. Sauce will thicken a bit. 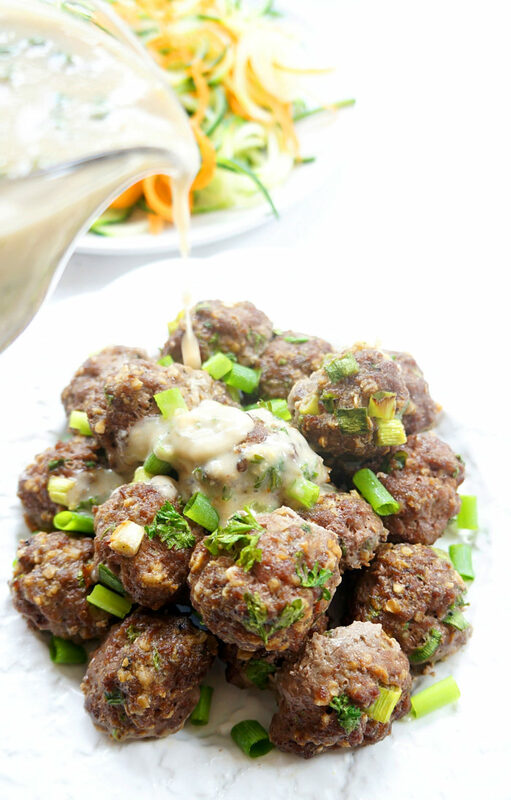 Add cooked meatballs to sauce or serve it as a dip with meatballs. Serve hot over zucchini noodles or brown rice. Girl! You had me at spicy peanut and coconut sauce! Actually you had me at the first thumbnail picture (but what’s new? Your pictures are always amazing!). Yum! Aww that’s so sweet of you J! Your comment totally made my day :) I appreciate you stopping by to comment! It’s definitely a tasty dish! Uuuuu! This sounds delicious! I love antique markets, you can find so many awesome props for food photography, too. Did you find anything interesting? Thanks so much Lorena! I was looking for props and I did find this gorgeous white tray! Just gave it a good coat of paint..love those kinds of finds!! 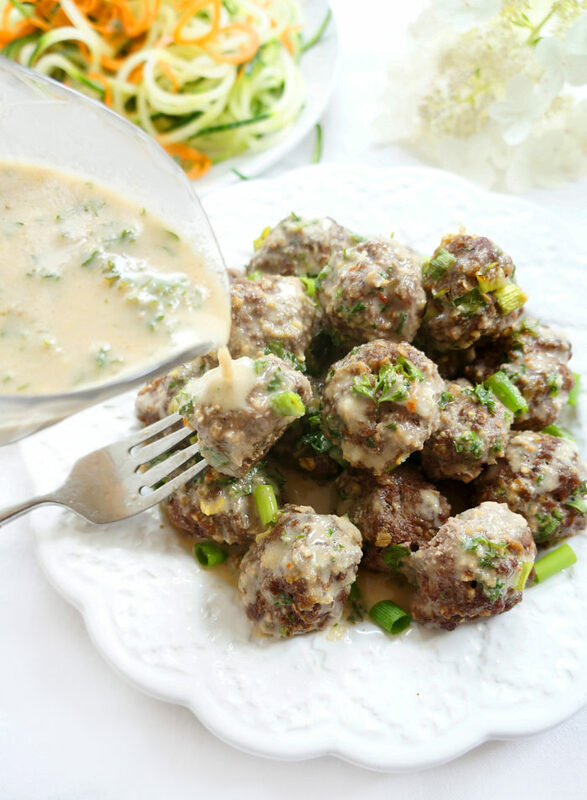 OMG Elysia, that thai coconut sauce sounds to die for, I love how you used it on the meatballs, this dish is a bomb of flavor. Thank you Katalina!! The sauce totally makes the dish! This looks and sounds amazing. I love all kinds of meatballs. I’m sure the seasoning and the sauce will work with any kind :) Think this will be part of the menu this weekend! Awesome Lydia! It definitely would add some nice flavour to any kind of meatball! Hope you enjoyed the recipe! can’t wait to try them, they look mouthwatering! happy DIYing! This dish sounds so yummy! Love all of those flavors! The flavors in these meatballs sounds really great! I am going to pin this recipe for later!! Thanks for the pin Chris! I would LOVE to chow down on a pile of these over some zoodles for lunch. Such a great flavor combination! They would make a tasty lunch or dinner! I know..I’ve tried both ;) Thanks for stopping by Becky! The words Thai and Coconut just makes me salivate. My brain’s wired that way. They look amazing. I want to just grab a piece from my screen. Gahh. Oh you and me both Ai! I’m drawn to those flavours too! Thanks for the comment! Oh this sauce looks amazing!!! I could probably drink it. I love coconut milk and ginger. 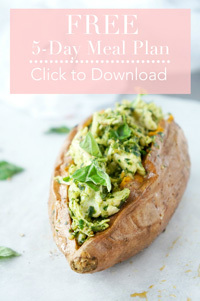 Definitely making this recipe asap! Not gonna lie Chrissa.. I totally drank the sauce out of the bowl after the meatballs were gone! The flavours we’re delish ;) hope you enjoy! I love anything thai….so it works for me!! I have an obsession with new meatball flavours, these will make a great addition to my collection!